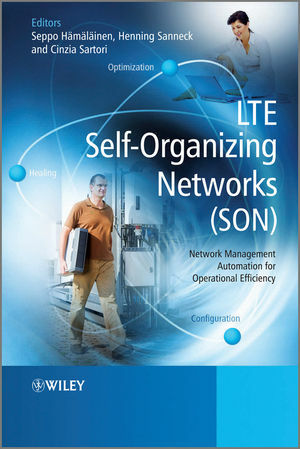 Covering the key functional areas of LTE Self-Organising Networks (SON), this book introduces the topic at an advanced level before examining the state-of-the-art concepts. The required background on LTE network scenarios, technologies and general SON concepts is first given to allow readers with basic knowledge of mobile networks to understand the detailed discussion of key SON functional areas (self-configuration, -optimisation, -healing). Later, the book provides details and references for advanced readers familiar with LTE and SON, including the latest status of 3GPP standardisation. Based on the defined next generation mobile networks (NGMN) and 3GPP SON use cases, the book elaborates to give the full picture of a SON-enabled system including its enabling technologies, architecture and operation. ”Heterogeneous networks” including different cell hierarchy levels and multiple radio access technologies as a new driver for SON are also discussed. Seppo Hämäläinen is research manager at Nokia Siemens Networks. He received an MSc degree in Electrical Engineering from the Department of Information Technology at Lappeenranta University of Technology in 1994 and a PhD degree in Electrical Engineering from the Department of Information technology at Jyväskylä University in 2003. He joined Nokia Research Center in 1993, where he worked in various research and research management positions until the end of 2005. From 2002 to 2005 he led Nokia Research Center’s office in China and at the beginning of 2006 he joined Nokia Networks, where he was director of Network Systems Research. He is now working with Nokia Siemens Networks. His research interests cover 3G and beyond 3G radio network performance and radio resource management issues and self-organizing networks. He is author or co-author of 50 scientific journal and conference papers and book chapters, and 18 independent patents. Dr. Henning Sanneck studied Electrical Engineering at the University of Erlangen-Nuremberg, Germany. After receiving his Diploma in 1995, he joined GMD Fokus (now part of Fraunhofer) in Berlin. At Fokus, he worked as a Researcher in the area of Quality-of-Service (QoS) support for Real-Time Services in IP-based networks. He received his Dr.-Ing. (PhD) degree in Electrical Engineering from the Technical University of Berlin with a thesis on Voice over IP QoS in 2000. In 2001 he joined Siemens - Mobile Networks in Munich, working as a Senior Research Engineer on cross-layer design for IP-based Radio Access Networks (RANs), Software Technologies for Mobile Networks and Technology Management. He became a Project Manager for technology innovation projects in the area of Network Management for 3G and beyond RANs in 2003, working on Basestation Auto-Configuration and Real-Time Performance Management concepts and their realisation as product features. Since the formation of Nokia Siemens Networks in 2007 he has been a Research Manager heading the "Network Management Automation" team. Dr. Sanneck has published 40 papers in refereed conferences and journals and has more than 15 patents granted or pending. Cinzia Sartori is Research Area Manager at Nokia Siemens Networks. After graduating in Electronic Engineer at the University of Pavia in Italy, she was based at GTE in SW Research & Development and transferred for 18 months to Phoenix (Arizona, USA). In the early 1990s she joined Siemens - Mobile Networks R&D- for the development of the “BSC–Base Station Controller” leading a SW team for SS7 and Radio Resource Management development; later she moved to “RAN System Engineering and Tests”. At the establishment of Nokia Siemens Networks in 2007, she lead the Network Telecom team in RAN System Architecture, dealing with 2G, 3G, WiMax and LTE call processing. Since November 2009 she has worked at the Radio Research unit of Nokia Siemens Networks and is responsible for the Self Organizing Networks (SON) research field. She participated in 3GPP standardization in SA2 working group and currently she leads the Nokia- NSN team responsible for defining the SON strategy in 3GPP RAN standardization.